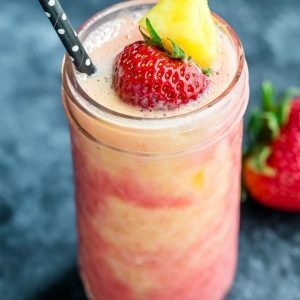 Beat the heat and embrace the chill with this Tropical Pineapple Strawberry Swirl Smoothie! Featuring swirls of pineapple and strawberry smoothie, this easy peasy recipe takes only a few minutes to make! In a blender combine orange juice, yogurt, pineapple, banana, and honey. Cover and blend until smooth. Remove half of the smoothie and add strawberries to blender. Blend until smooth and creamy. Alternate adding the two smoothie fillings to two glasses for a pretty swirled effect. Enjoy! Nutrition facts below are an estimate provided by an online nutrition calculator.